If you suffer from gluten intolerance, one of the foods you will miss the most if you cut out wheat is bread. Fortunately, there is a great alternative, which is to eat one of the many gluten free breads that are now available. In many parts of the world, this kind of bread is not difficult to find. You can buy it in large supermarkets, health food shops and it is relatively easy to find online. Unfortunately, gluten free baked goods and bread can be quite expensive. Most of these products carry a heavy premium. For this reason, many people with food intolerances find it too expensive to eat as much gluten free bread as they would like to. However, there are a couple of ways around that issue. Here we explain them both, but to take advantage of these methods you first need to understand how to store gluten free products. You need to be careful when storing gluten free cooked goods. I have found that bread that is made with gluten free flour has a tendency to dry out faster. Therefore, I store my bread in an airtight container as well as leaving it in its wrapper. Some people store their bread in their fridge rather than on the counter top. I do this in the summer, but not in the winter. When I am freezing homemade low gluten bread, I wrap it in cling film then wrap it in foil to make sure no moisture enters the bread before it has frozen properly. I also find it freezes better if you allow it to cool for at least three hours rather than just being cool to the touch before you freeze it. If you find that your homemade gluten free bread has a tendency to break up try using a different combination of gluten free flours. You can find a comprehensive list of foods that contain gluten on this page. There is no need to let the bread defrost naturally if you do not want to. Just take the slices you need out of the freezer, wrap each one in a damp tea towel, and put it in the microwave for 20 or 30 seconds to defrost it. If you have a low power microwave, it may take a little longer. Be careful to use a freshly laundered tea towel to avoid germs. When you heat up the bread and tea towel, you are creating the perfect moist and warm condition for germs to multiply, so it is very important to use a fresh tea towel. Some people say you can do it with slightly damp kitchen towel instead, but I have never tried this, so cannot vouch for that method. Right now you know how to store no gluten bread properly you are in a position to either buy it in bulk when you see it on special offer or bake your own in bulk. 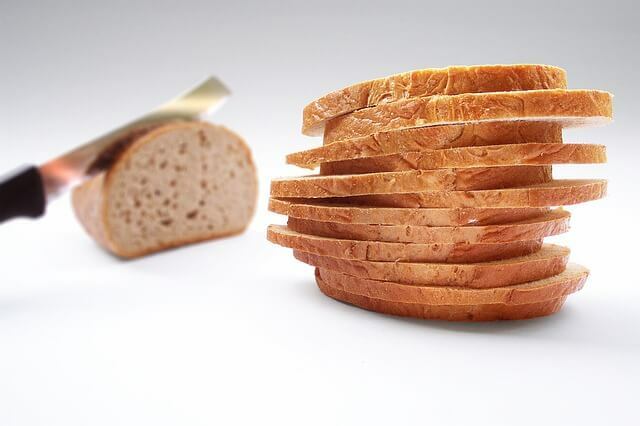 Alternatively, you could make it each day using a bread machine and slice up and freeze any leftover bread for those days you are too busy or if you are like me the days you forget to flick the switch on the plug to the on position. Unfortunately, I have done that more than once.